Islamic State (IS) leader Abu Bakr al-Baghdadi has reportedly been “critically” injured in a US-led airstrike in Iraq that targeted a convoy of military vehicles allegedly carrying a group of senior ISIS members, convoy consisted of 10 Islamic State armed trucks. According to Al Arabiya, Al-Hadath, Daily Mail and RT News Agency report, the leader of the extremist militant group Islamic State, Abu Bakr al-Baghdadi was “critically wounded.” in a US-led airstrike in Iraq. However, US Central Command Official Col. Patrick Ryder could not confirm whether Islamic State (IS) leader Abu Bakr al-Baghdadi was at the gathering targeted on Friday. 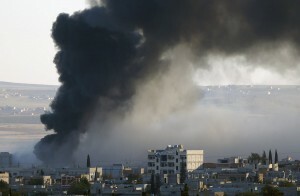 The strikes destroyed a convoy of 10 armed trucks, says Washington Post. Mosul morgue official said 50 bodies of (IS) Islamic State militants were brought to the facility after the air strike. (IS) Islamic State had been changing its strategy since the air strikes began, switching to lower profile vehicles to avoid being targeted, according to residents of towns the group holds. Witnesses told Reuters an air strike had targeted a house where senior ISIS officers were meeting, near the western Iraqi border town of al-Qaim, and said ISIS fighters had cleared a hospital so that their wounded could be treated, using loudspeakers to urge residents to donate blood. 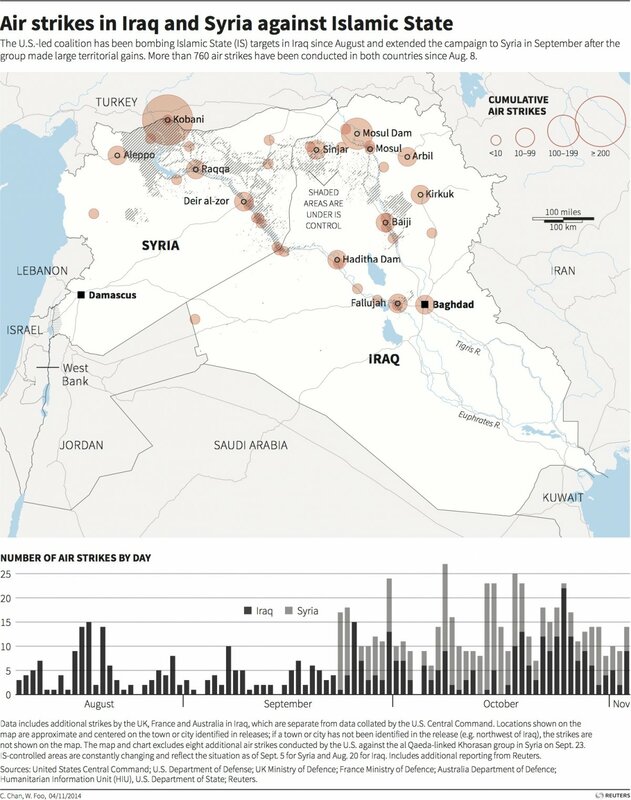 Maps locations in Syria and Iraq where the U.S.-led coalition has conducted air strikes against Islamic State targets, includes chart of air strikes by day. President Obama has approved sending up to 1,500 more troops to Iraq; authorizing the US military to send more troops to Iraq. That would nearly double the US military presence in the country. He also requested $5.6 billion for the fight against the Islamic State (IS).